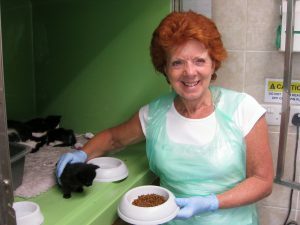 WE’RE CELEBRATING ‪#‎volunteersweek 1-12 June, and sharing one volunteer’s experiences of helping us out as a cat carer at the South Cave cattery… Meet Angela! Q: Why did you volunteer for C4C? When I retired from work I had time to give to volunteering. 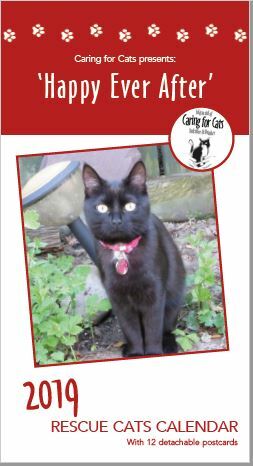 Having always got my cats from the wonderful CfC homing centre and seen the excellent work the carers do, I knew how much they relied on dedicated volunteers. As soon as I had the time to give I approached the charity and offered to help. Q: How long have you been volunteering? I started volunteering in February 2014 and I still really enjoy helping, so it’s been about 2 1/2 years now. I volunteer regularly one evening per week from about 5-8pm. I will also help out with an extra shift occasionally and with fundraising events. Q: What do you like best about volunteering with C4C? I just love cats….so it is paradise being surrounded by so many beautiful animals! I particularly like the opportunity to help the cats when they need the support most and help them on their way to a loving home. In their early days with the charity some of the cats are very timid and I need to think carefully how I can best support them. It can be challenging but very rewarding when they start to trust you. Q: What have you learnt from your voluntary work/experiences? I have learnt so much about cat behaviour. The charity are very experienced at their work and I enjoy learning. I have also met lots of very nice people who I enjoy working with. Q: What is your favourite cat type?! There is always one that you fall in love with perhaps because they are so full of fun, pretty to look at or so very needy, but basically I don’t have a favourite type….I love ’em all! Q: What advice would you give to anyone thinking about volunteering with us? Contact the charity and ask if you can give volunteering as a carer a try. You will then be offered the opportunity to work alongside an experienced carer to see if you feel comfortable. You will know straight away whether it is for you. Anytime you can give will be welcome, but you do need to be reliable, you cannot let the cats down.